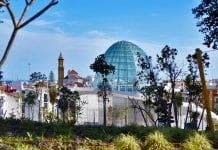 IT has taken five years to construct and cost an eye-watering 90 million euros, but finally Andalucia has a world’s first in architecture. The stunning Metropol Parasol in the heart of Sevilla is officially the largest wooden structure around the globe. The latest example of Spain’s stunning Avant-Garde architecture, the mushroom-like building has finally been unveiled to the public. The honeycombed masterpiece, located in Plaza de la Encarnacion, provides a fitting centre piece to the new public space. Elsewhere, in yet another exciting new architectural unveiling, an environmentally-friendly school, Plaza Ecopolis, has been developed in an industrialised area of Madrid. In a clever design, surrounding parkland will be kept green using rainwater captured by the building. Meanwhile, new headquarters for the regional regulatory council for Ribera del Duero (CRDO) have been unveiled, mixing the old with the new. The former hospital and 11th Century church were awarded The Emirates Glass Leaf Award. Elsewhere, the historic walled city of Caceres has its first stylish boutique hotel, which includes the Atrio restaurant. It is the result of seven years of restoration work and is part of luxury hotel group Relais & Chateaux. Andalucia has a big termite problem.